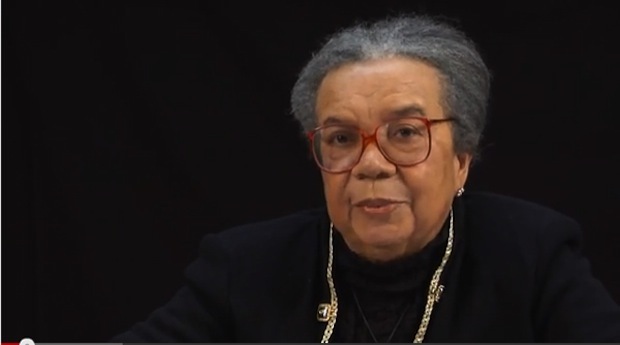 We have a saying in the African American community: “Give them their flowers while they yet live.” Marian Wright Edelman is an elder who has been in the trenches of the war on poverty and advocate of children’s right since1960s. In this 21st century, she still holds up the banner, lighting a path for those who would follow. For several years I read her inspiring articles whenever I picked up a hard copy of the now also online San Diego Voice Viewpoint http://sdvoice.info/. One day at a library sell, I bought one of her books; she Has authored several. Her “voice” never waivers. She is a strong advocate for children’s better lives. Cloudy overcast early mornings are perfect for me to write about other people’s lives. It seems easier to concentrate when sunny rays are silent. Clouds seem to invite introspection. Marian Wright Edelman . . . her name is synonymous with the 1960s War on Poverty and as well as with historic and contemporary children’s rights issues. She has not only witnessed America’s continuously tumultuous limping run towards a nebulous horizon of future equality, but she has also participated in several of its most significant steps. Her autobiography Lanterns: Memoirs of Mentors is a must read, especially for today’s young woman of color who is curious about how our elders whose time on this contested life stage became who they are today. Secondary school teachers should include books like this, written by our elders who have talked the talk and walked the walk of public service. Lanterns: Memoirs of Mentors should be on added to recommended summer book list readings for inner city high school students.1 Edelman’s narrative prose is easily accessible with a clarity that invites readers to engage a positive, productive faith-based African American world that existed and still exists, but which gets little or no acknowledgement outside of the general Black community. Perhaps that is as it should be. It is a culture that should thrive, not become social media fodder poisoned by consumer ideological packaging, left to dry up seared by market driven trivialization like a raisin in the sun. Her narrative goes on to recount her childhood, one that parallels so many African Americans of that era whose parents protected them from as much of the negativity of oppression, racial prejudice, and gender bias as they could. Parents and neighbors built a village to raise the children among them. The concept was an attitude before it became pop culture smart talk, quick quote on an Internet site with wise saying for lazy students who do not want to read and extract the quote from its actual context. (Yes, I’m aware that its what we do now. I confess, from time to time that in a moment of weakness, do too). After her childhood, in the body of her autobiography, Edelman reflects on her travels throughout famous cities in Europe–Ireland, Scotland, France, Poland as well as her travels and experiences in rural America. She recounts various encounters with people who contributed to her growth as an intellectual activist. They provided a a safe discursive place to exchange ideas. They gave her opportunities to challenge, reconfigure, and sometime refute their ideals. They provided mentoring which contributed to her critical rethinking about the concept of the “state of our union”, its real life manifestation in education, politics, economics, and social movements. Charles E. Merrill Jr., Howard Zinn, Dr Benjamin E. Mays, Robert Kennedy ( Edelman played a pivotal role in the 1960s “War on Poverty”) and others who inhabited her intellectual and public life experiences are a few of the most famous “lanterns” that she discusses spanning her years at Spelman College, Yale and beyond. They nurtured her ability to create viable solutions to real life problems, to create solutions. That youthful ability thrives in her life today. Less than 200 pages long with a Works Cited page for access to quoted sources, Marian Wright Edelman’ Lanterns: Memoirs of Mentors embeds a bonus topic: how she became an advocate for children before founding the Children’s Defense Fund. She still talks the talk and lives the walk today in her seventies. In the twenty first century, she continues to advocate and defend children’s rights. Her life today stands as a watchman calling in the night for justice on our sometimes politically charged socio-media driven frenzy for new topics to discuss. She rings the bell, sounding a concerned alarm against intransigent child poverty, negligence, and oppression. 1. Marian Wright Edelman. Lanterns: Memoirs of Mentors. (1999: Boston: Beacon Street Press). She is also the author of The Measure of Our Success. 2. Marian Wright Edelman. “Preface” in Lanterns: Memoirs of Mentors. (1999: Boston: Beacon Street Press). 4. Marian Wright Edelman. “America as Mentor for Its Children” in Lanterns: Memoirs of Mentors. (1999: Boston: Beacon Street Press).